VISINE A.C.® Ultra Itchy Eye Relief Astringent/Redness Reliever Eye Drops contain two active ingredients that temporarily relieve discomfort and redness of the eye. Ask a doctor before use if you have narrow angle glaucoma. If pregnant or breast-feeding, ask a health professional before use. Keep out of reach of children. If swallowed, get medical help or contact a Poison Control Center right away. The only one that works! I suffer from severe allergies to animals and who knows what else. At times my eyes will itch so badly that I can’t stop rubbing them and eventually end up with swollen red eyes. I have tried the regular Visine allergy which works fine but the A.C. Takes care of the problem immediately. It stings at first which pales in comparison to the pain I cause my eyes from rubbing them. Once the burn is gone no more itchy red eyes. I don’t have to use them often but when I do, they come through for me! Thanks Visine! We want to learn more about your experience with this product. Give us a call at 1-888-734-7648. We're available Monday-Friday 9AM-5:30PM ET. When you call mention your username to our team. We hope to chat soon! I have used Visine Original for 50 years. Recently Walmart was out of the Original so I bought the Maximum. I figured it wouldn't be much different. WELL, all of a sudden my eyes started burning. Didn't take me long to figure out what it was. Now I am very shy about trying any Visine again. I am going to try another eye drop. Very disappointing, thought I had a good product. We're terribly sorry about this, we would like to learn more about your experience using our product. Please give us a call at 1-888-734-7648 M-F between the hours of 9A-5:30P ET. Thank you and have a great day. We want to learn more about your experience and see how we can help. Give us a call at 1-888-734-7648. We're available Monday-Friday 9AM-5:30PM ET. When you call mention your username to our team. We hope to chat soon! Wifey Loves it BUT. . . . .
Wifey loves the product . . . . . but have yet to find it available in the 1 oz size. . . . only in the 0.5 oz package. Where are the full one ounce sizes available, please? Noah 8-? First try it burned and still had itchy eyes. Second try no burning and itchy eyes very little. Second day no burning and no itchy eyes. I love it! We're happy to hear the product is working out for you! We'd like to chat more about your first day using the product. Please give us a call at 1-888-734-7648 from 9AM - 5:30PM ET, Monday through Friday. Thank you! My eyes feel great now! Occasionally I have allergies that affect my eyes. I tried Visine A.C. this year since I had success with it in the past. This really helps my eyes feel normal without having to take allergy pills. This product is amazing. I had very bad allergies the past two weeks. My eyes were irritated and itching non-stop for two weeks! I tried the antihistamine drop called Zaditor. It didn't work and made eyes worse with itchy. Sometimes, I feel like I can't open my eyes when sleeping after using Zaditor. I tried the regular Visine and it does a great job with the redness, but my itchy and watery eyes comes right back. 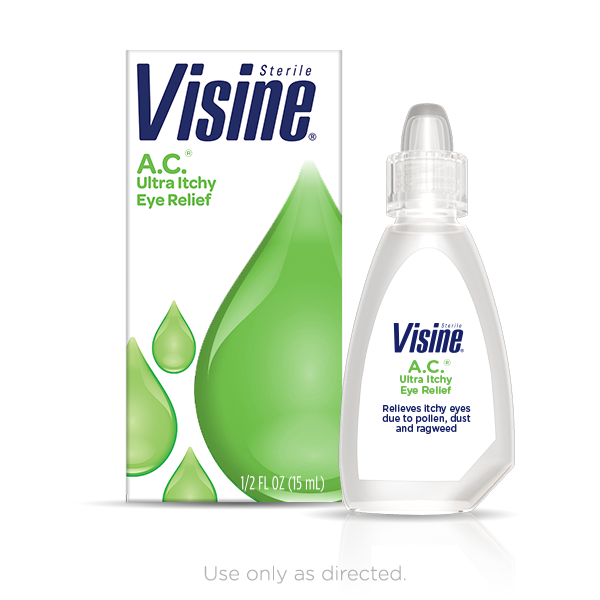 I got desperate and bought Visine AC, I think I tried a different version of it last year and it work. It really burned at first. I was worried about the burning. Then, a miracle happened, my itching finally stopped after two weeks! But my redness is still there though...I am going to try it a little longer to see the results. Thank you for writing this review. We'd like to learn more about your experience. Please give us a call at 1-888-734-7648. We're available Monday-Friday, 9AM-5:30PM ET. We look forward to speaking with you. My eyes get red and swollen each allergy season and I always buy Visine. I’ve never had a problem until I decided to try the Ultra Itchy Eye Relief. I put a drop in and it burned so bad. It’s almost like this product enhanced my symptoms. I’m glad I tried it on a day that I didn’t have to go to work. Hi there, thanks for taking the time to write your review on this product. We wouldn't expect this from the Ultra Itchy Eye Relief, so we'd like to learn more about your experience. Please give us a call at 1-888-734-7648. We are available Monday through Friday 9 AM - 5:30 PM ET. We look forward to hearing from you! © Johnson & Johnson Consumer Inc. 2016. All rights reserved. This site is published by Johnson & Johnson Consumer Inc., which is solely responsible for its contents. It is intended for visitors from the United States. If you are in the US call toll free 1-888-734-7648 or click here to contact us. Site updated November 21, 2016. Third party trademarks used herein are trademarks of their respective owners.